When you need a container that handles your assets, allows you to stack, gives you customized industry storage, and is collapsible, the choice becomes easy. 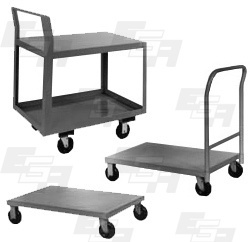 EGA’s durable containers hold bulk goods high up on pallet racks, or on the ground. Wherever needed, these bulk containers work for you. No more looking up at racks and trying to guess what's inside. EGA Visualtainers™ let you see your inventory so that you can keep adequate parts close to the production line—a practice crucial to today's JIT production processes. 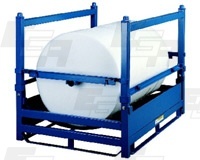 These versatile units can be stacked six high at a rated capacity of either 2,000 or 4,000 lbs. Available in both standard and custom designs. 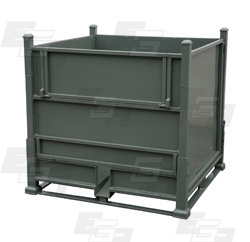 Store your smaller items or granular materials in EGA Solid-Sided Dunnage Containers. Available with corrugated or flat sides in 7- through 16-gauge steel. Standard sizes are offered in height increments of two inches. Floor clearance ranges from 4 to 12 inches. Top flanges can be turned in or out depending on your application. Send your custom specifications and we'll return standard quotes within one business day. More complex or higher-quantity quotes might take 2 to 3 business days. No more looking up at racks and trying to guess what's inside. EGA Visualtainers™ let you see your inventory so that you can keep adequate parts close to the production line—a practice crucial to today's JIT production processes. 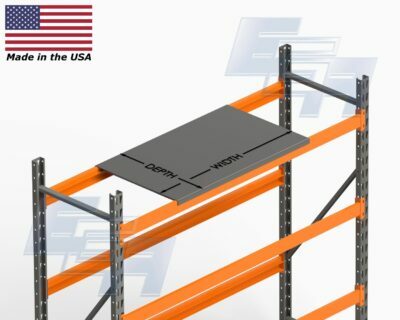 EGA Die Shelves feature solid sheet steel decks that increase the strength and utility of your existing pallet rack locations. Designed for standard 1 5/8" step beams, these die shelves are available in 2,000 to 6,000 lb. 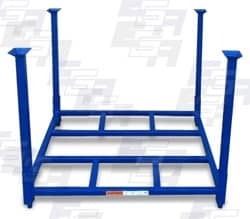 Rigid frames, all-welded construction, and sturdy steel decking make these trucks, dollies, and carts ideal for stockroom, shipping, receiving, production, and warehouse operations. EGA Portable Stacking Racks are a versatile answer to your ever-changing storage, handling, or transporting needs, allowing materials to move through your entire production process...all on the same rack.